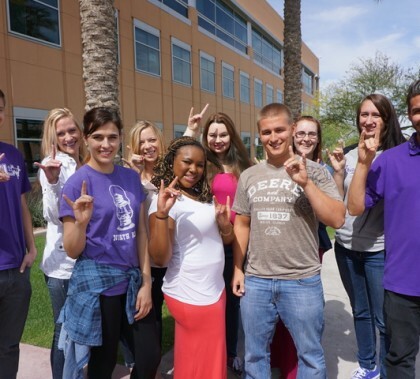 This week’s Antelope Intros features two GCU graduates with diverse backgrounds. One was born overseas and loves the sports teams from another West Coast city, the other loves sci-fi and showed it with the skill she taught her little sister. This week’s Antelope Intros feature an online teacher who got turned on to GCU while working in Idaho and a new member of the athletics department whose favorite sport while growing up in Southern California might surprise you. This week’s Antelope Intros feature an employee who has parlayed his love of baseball (warning — he’s a fan of a team that’s not too popular around here) into a greater involvement in the game and one who is happy to follow sports from afar. The new employees in this week’s Antelope Intros both are online faculty members who are at least relatively new to Phoenix. One of them has some impressive coaching accomplishments, and the other takes his love of environmental photography to electrifying heights. After hiring 67 of its own graduates in 2014, Grand Canyon University so far this year has hired 28 others for entry-level positions that help them chart meaningful career paths and earn master’s degrees. GCU Today has a story about how students are using those opportunities to their advantage, and how some love their gigs so much, they may never stop working for their alma mater. This week’s edition of Antelope Intros features a 27th Avenue employee who finds joy in teaching, music and, of all things, carpooling and a Pennsylvanian who’s devoted to helping her four children and all the prospective GCU students she serves — and knows quality barbecue when she tastes it. Our two new employees in this week’s Antelope Intros both are the positive, adventurous type. One loves to try new things, including being an extra in a popular movie, and the other concentrates on having a good attitude and has one sport that’s right up his alley. This week’s Antelope Intros are a couple of university development representatives who stand out as leaders and positive thinkers. One set an unusual record while playing baseball, and the other surprises people when they find out about her family background. This week’s Antelope Intros feature a mom who loves doing things for others but especially for her family and a GCU club coach whose family has its act(s) together when it comes to the theatre.